Texas is home to over 105 different species and subspecies of snakes. Only 15 of those are potentially dangerous to humans. Those are the snakes that we feature here. For more general information on all the snakes of Texas, please visit our Snake pages. Pit vipers are venomous snakes that have an opening on each side of the head between the eye and the nostril. In Texas, we have 3 groups of these snakes: Copperheads, Cottonmouths, and Rattlesnakes. 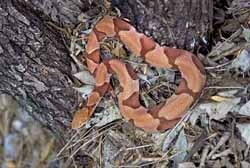 Copperheads have chestnut or reddish-brown crossbands on a lighter colored body. 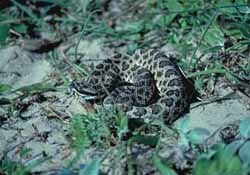 These snakes are found in rocky areas and wooded bottomlands and are rare in dry areas. In the spring they can be found along streams and rivers, as well as in weed-covered vacant lots. There are three subspecies of Copperheads in Texas; Southern copperhead (A.c. contortrix), 20-30 inches long and found in the eastern one-third of the state; Broadbanded copperhead (A.c. laticinctus), about two feet long, widely scattered in central and western Texas; and the Trans-Pecos copperhead (A.c. pictigaster), 20-30 inches in length and found near springs in the southern part of the Trans-Pecos. The Latin name piscivorous means 'fish eating,' indicating its dietary characteristics. 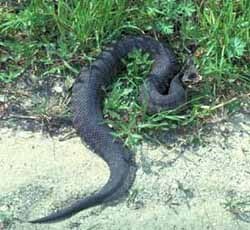 Also known as 'water moccasins', only one recognized supspecies is found in Texas; Western cottonmouth (A.p. leucostoma). Cottonmouths can be dark brown, olive-brown, olive green or almost solid black. They are marked with wide, dark bands, which are more distinct in some individuals than in others. Juvenile snakes are more brilliantly marked. The cottonmouth gets its name from the white tissue inside its mouth, which it displays when threatened. This heavy-bodied snake, which averages about 3-1/2 feet in length, is found over the eastern half of the state in swamps and sluggish waterways, coastal marshes, rivers, ponds and streams. Western massasauga (Sistrurus catenatus tergeminus), light gray, with brown oval blotches along the middle of the back and smaller blotches along each side. They are two feet in length and found through the middle of the state in grasslands, marshy and swampy areas. Desert massasauga (S.c. edwardsii), lighter in color than the western massasauga, smaller and more slender. Found in the Trans-Pecos, western Panhandle and the lower Rio Grande Valley. Western diamondback (Crotalus atrox), Brown, diamond-shaped markings along the middle of the back and alternating black and white rings on the tail. Averages 3 1/2 to 4-1/2 feet in length, and can reach seven feet. 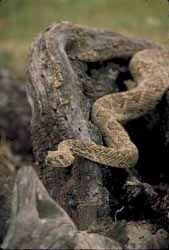 This is the most common and widespread venomous snake in Texas, found in all but the easternmost part of the state. Timber rattlesnake (Crotalus horridus) also known as Canebreak rattlesnake is a large, heavy-bodied snake averaging 4-1/2 feet. Brown or tan with wide, dark crossbands. Tail is entirely black. Found in the eastern third of the state in wooded areas in wet bottomlands. Mottled Rock rattlesnake (Crotalus lepidus) is light bream or pink background with widely spaced, dark crossbands and mottled areas between the crossbands. Small and slender with an average length of about two feet. Found in the mountainous areas of West Texas. Banded Rock rattlesnake (C.l. klauberi)Similar to the mottled rock rattlesnake, but darker greenish-gray in color. Found only in the extreme western tip of Texas. Blacktail rattlesnake (Crotalus molossus) is gray to olive green with dark blotches along the back and a black tail. Averaging a length of 3-1/2 feet, it is found from Central Texas throughout most of West Texas in bushes and on rocky ledges. Mojave rattlesnake (Crotalus scutulatus) is similar to the western diamondback in markings, but smaller and more slender and found only in extreme West Texas. The brightly colored Texas coral snake is the state's only member of the Elapidae family, which includes the cobras of Asia and Africa. 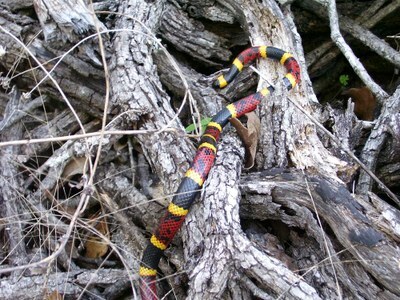 The coral snake is slender with a small indistinctive head and round pupils, and is usually is 2-1/2 feet or shorter. Its distinctive pattern is a broad black ring, a narrow yellow ring and a broad red ring, with the red rings always bordered by the yellow rings. Several harmless snakes are similarly marked, but never with the red and yellow touching. 'Red on yellow, kill a fellow; red on black, venom lack,' is a handy way to distinguish the highly venomous coral snake from nonvenomous ringed species. Coral snakes are found in the southeastern half of Texas in woodlands, canyons and coastal plains. Learn to recognize the snake species that are likely to be in the area. Please do not kill a snake - even a venomous one. Snakes serve a valuable function in the environment. The majority of bites result from people taking unnecessary or foolish risks with venomous snakes. Understanding what snakes look for in suitable habitat can help you know when to be wary. Understanding their behavior will help you know what to do if you encounter one. Snakes like tall grass. Snakes do not prey on humans and they will not chase you, in fact they usually retreat or escape if given the opportunity. The danger comes when they are either surprised or cornered. Do not play around with a dead snake, they have been known to bite and envenomate. Get a good field guide and keep it handy especially in the field.